Raised impressions, using clay and stone plaster are a Beautiful way of capturing a precious moment in time and keeping a memory forever. The hand, foot or paw print impressions of your baby, child/ren, loved one, whole family or beloved pet, can be finished in several effects and colours including, natural, gold, sliver, bronze, pearl, baby blue or pink. They can be framed with a photo of your loved one or kept as a plaque or wall hanging. Please find price details and how to book an appointment below. Taking an impression is quick and safe. We gently press hand/feet in clay which only takes few moments so will not distress your baby or child. As with 3d castings, Raised Impressions capture every detail of your loved one/s precious hands and/or feet. They can be placed inside a frame of your choice,or kept as a plaque or wall hanging. We can take Raised Impressions or individual baby/children or groups, there are many combinations that can be personal to you..please feel free to discuss any design ideas you may have. 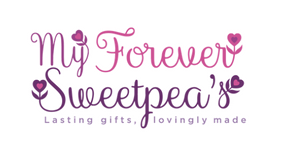 Appointments can be made by contacting Fiona on Tel.07891710974 or email fiona@myforeversweetpeas.co.uk . All home visits are free within a 20 mile radius of EX38 or a £5 fuel charge for each 10 miles outside this distance will be added to your casting price.